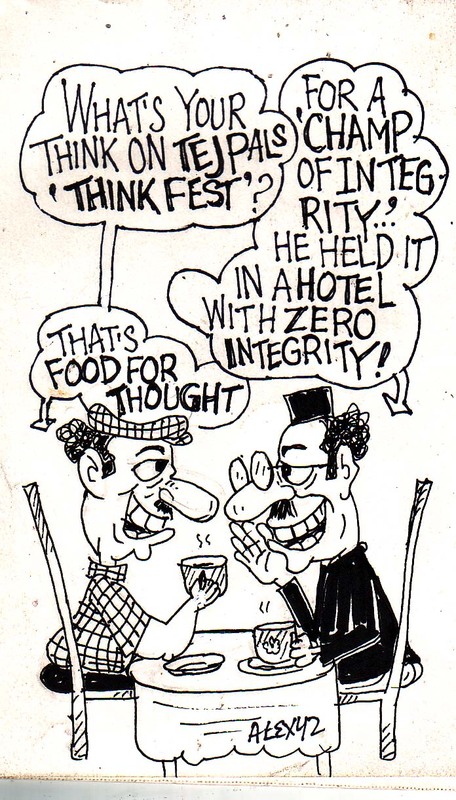 You already know that the recently concluded Thinkfest, organized by Tehelka, was partly in the news for the wrong reasons. In addition to being hosted by alleged violators of the coastal zone regulations, and being backed by mining interests, serious charges had also been brought against the editor of Tehelka, Mr. Tarun Tejpal. One of these charges was brought by an anti-mining activist, Mr. Hartmann de Souza, who alleged that Tejpal had deliberately silenced a critical story on the illegalities involved in Goa’s mining industry. 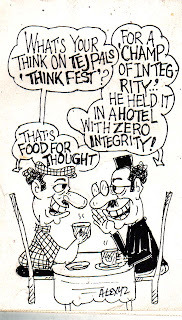 Subsequently, Tejpal got into trouble for making a suggestion that when people come to Goa, in this case guests at the Thinkfest, high on their priority was engaging in sexual and other sensorial excesses. Tejpal responded to Mr. de Souza in a profoundly insulting riposte in the Hindustan Times, attempting to deny the charges of silencing the mining story; and denied the charges regarding his statement at the Thinkfest. In his rebuttal, de Souza piled one fact upon another to demonstrate the hollowness of Tejpal’s defence. One came away from reading de Souza’s response to acknowledge that there was indeed something sticky about Tejpal, Goa and the mining issue. What this systematic destruction of Tejpal’s fig leaf left untouched however, was the colonial thinking that Tejpal had demonstrated in his response to de Souza, and which seems to have manifested itself in his alleged statement at the Thinkfest. Tejpal’s response to de Souza commenced with the title ‘Albert Pinto ko gussa kyon aata hai’ (What makes Albert Pinto angry?). For those not in the know, the title refers to the 1981 film by Saeed Mirza featuring the socio-political dilemmas that face a young working-class Catholic man in midst of the socio-economic turmoil of Bombay in the 1970’s and 1980s. Interestingly, while the film itself offers a critical and sympathetic look at a subalternsocial group that in addition to being a religious minority was further marginalized economically and politically, Tejpal’s title does the opposite. If there is a link to Bollywood in Tejpal’s title, then it is to the ‘Anthony Gonsalvez’ from the film ‘Amar, Akbar, Anthony’ (AAA). If Mirza’s film paints a realistic likeness of a community, AAA paints the Indian west-coast Catholic into a caricature. This caricature is not unfamiliar to us, Bollywood repeatedly casts, dismissively, the Goan-East-Indian communities as jolly (read alcohol-charged) fellows, ready for the singing and dancing. One cannot really expect them to mount a serious argument, and they are at best given to spontaneous bursts of emotion; like children really. This reading of Tejpal’s title is borne out by the manner in which he structures his response, where he rebuts every allegation, only by mocking de Souza’s alleged inability to follow an argument, or his alleged collapse into hysterical anger. The underlying message of Tejpal’s response is unmistakable; you can’t take this de Souza fellow seriously, discussing with him being an experience akin to arguing with a child (or a drunk). This was a colonial tactic too. The white-man assumed a colonial burden of educating the childlike noble savages into civilization, and the techniques of democratic governance. Tejpal then takes up another technique used by the white man in his colonial drive. One of the justifications for colonialism was the inability of the colonized native to effectively harness the resources of the locations they lived in. The colonizer was effectively doing them a favour by effectively exploiting the local resources for development. Tejpal informs us in his response to Mr. de Souza that “the house we bought was an old ruin in an inner village”. In his rejoinder to this riposte, de Souza informs us that there were also words like “I mean, look at Moira man, it’s a dying Goan village”. Tejpal would perhaps prefer if we did not rely on de Souza’s version of the conversation between the two of them, but it does not change the way in which we read Tejpal and his statement. The point of Tejpal’s argument is clear, he is doing Goa and Goans a favour by buying an ‘old ruin’ that Goans themselves (shame on them) do not value, and he is going to breathe life into it. Could the colonial logics be any clearer? The colonial master values (the delicate Goan architecture) what the local savage (the Goan so blindly destroying his own culture) does not. This logic of saving has been a part of the rhetoric of a good number of those who come into Goa buying Goan property, and oftentime home-bred Goans themselves. To make this argument is to fail to see the complex mix of reasons, the socio-economic and political reasons, why Goan homes are being pulled down. To blame the Goan is all too easy, but then this easy response is part of the colonial technique of simplifying matters so that the more complex argument brought on by the colonized seem like misplaced anger, and blind stupidity. We should not forget the histories of other colonized places, where impoverished persons of the local communities (be they the First Nations of America, or the adivasis of Central India, the aborigines of Australia) were first impoverished, and then made to sell to the colonizer what they would not have contemplated selling before. This process of impoverishment, and forced selling of livelihood and history, is not uncommon even today in large parts of India, not least in Central India. Tejpal does not see himself as part of a colonial machinery. After all how could he, given that he sees himself as the good guy fighting against the evil forces of corporate greed. But perhaps Tejpal has not followed his own logic carefully. In his response he indicated that he pleaded with de Souza to make space for ‘complexity, in an intricately intertwined world.’ If we acknowledge this intricate intertwining that Tejpal suggests, then we must also acknowledge that while we fight the good fight elsewhere, we are also implicated in the evil conquests elsewhere. The problem with the left-leaning Indian liberal is that they do not realize that they are as Indian as the Indians they fight on other fronts. Despite their battles, they share many traits of an Indian-ness, and they too are engaged in an Indian national project, though they differ on the tiny details of this project’s agenda. And so it is, when de Souza protests against the kind of colonial enterprise that Tejpal is associating with in the Goan context, Tejpals suggests that ‘I suspect, for him if it isn’t Goa it doesn’t count.’ What is this if not the kind of charge of anti-nationalism that gets leveled against all those who protest against the excesses of the Indian Union’s colonial project, whether it is in the mountains of Kashmir, the jungles of Jharkhand, or the banks of the Brahmaputra? Tejpal leveled this charge against de Souza three times, ignoring the personal history of a man, committed to another kind of Indian-ness. The Indian left-liberal may oppose Hindu fundamentalism, but this is largely because they don’t like this ‘return-to-the-Vedas’ kind of Brahmanism that the RSS pushes. On other fronts, they will push their own particular brand of Brahmanism, a form that Pandit Nehru was particularly fond of. One could call this, ‘playing the white man’. On the one hand Kashmir is important because it stresses our Aryan roots, on the other hand Goa is important because as long as they continue to keep up this ‘piece-of-Europe-in-India’ story, they can continue to pretend they are white people. Let us not forget the alacrity with which the former play-spaces of the white masters were taken over by the post-colonial Indian babu; from Lutyen’s Delhi, to the Himalayan and other hill-stations, Pondicherrry, and Goa. In light of the colonially loaded sub-text of Tejpal’s response to de Souza, one should not be surprised if Tejpal did indeed make those vile remarks in the course of the Think Fest. But we would do ourselves an injustice if we restricted our gaze to Tejpal alone. The larger issue is that there are so many Tejpal’s out there, busy pushing a contemporary colonial agenda. These Tejpals exist both within the ranks of the 'insider' as they do within the 'outsider'. The issue is, what do we do about them?